An improvement engine for achieving world-class performance. The 20 Keys is a performance improvement system like no other. It is template driven so it’s repeatable and objective. 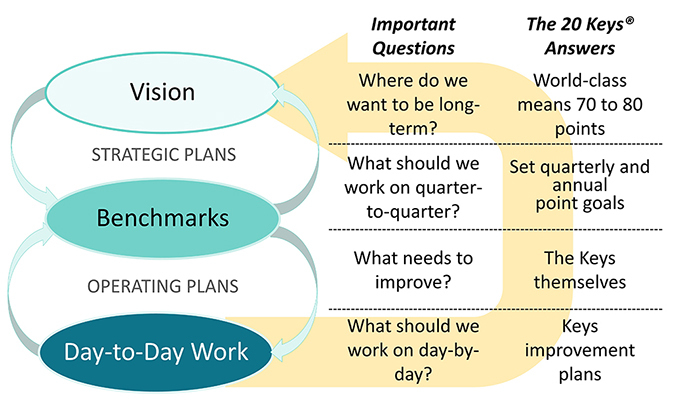 It engages people in measuring their current performance (baseline) and it provides a way for them to make decisions about what to work on and how best to achieve next-level results. Because of this engagement, the 20 Keys ensures that the work people are doing to improve their processes is relevant to them. Relevance and alignment are the two most important aspects of successful operational excellence systems. Kaufman Global has been using and improving The 20 Keys method for two decades. It is integrated into our improvement approach from top to bottom. We’ve developed applications across all functions and targets: Manufacturing, Business Process, Supply Chain, Healthcare and Hospitals, Finance, Maintenance, Logistics, etc. Traditional: What we would expect to see somewhere that’s not too concerned about improvement. Learning: Some steps have been taken. Leading: Changes happening. The organization is aware. A performance system is forming. World-Class: The operation is paying careful attention to process performance and innovation is happening. The system works, but is not fail safe. Currently Invincible: The way the operation works is uncommonly good. It would be difficult for the competition to copy since the overall performance system is driving improvements big and small. The performance system adapts to a dynamic environment. The 20 Keys links workgroup activities to world-class, intuitive benchmarks and ultimately to the vision of operational excellence. Kaufman Global has developed sets for most applications. Contact us to find out how we make the 20 Keys fit-for-purpose in your enterprise. Kaufman Global has developed 20 Keys templates for dozens of applications. It is one of the cornerstones of our system for Rapid Performance Evaluation and the 20 Keys are a primary elements in our Lean Daily Management System. The 20 Keys was introduced by Iwao Kobayashi in his book: The 20 Keys of Workplace Improvement. Kobayashi’s “systems” view of operational performance was ahead of it’s time and even today we continue to fight against a symptom we call “toolitis” which in its simplest form is the overuse of the Kaizen Event. Q. How are the 20 Keys applied within a workgroup? / A. Via the Lean Daily Management System. Q. Can and should we use them to compare workgroups, locations, geographies? / A. Can you… Yes. Should you… Depends. Q. How do you roll-up a site with multiple workgroups having different scores on the 20 Keys? / A. Some organizations average. We prefer the lowest common denominator approach. We’re happy to share our experiences. Contact us to learn more about how to make Kaufman Global’s 20 Keys a cornerstone of your Operational Excellence system.